1000 years of history. Living tradition. 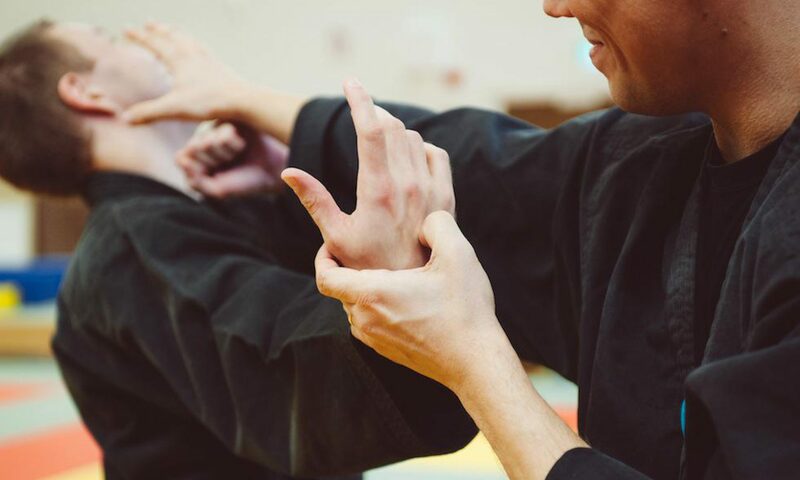 We study the japanese martial art of Bujinkan Budō Taijutsu, which is based on Ninja and Samurai traditions that date back a thousand years. The art combines unarmed and weapons training to develop universal principles of survival. We aim to achieve smooth natural movement, an immovable mind, and a sincere heart. The teachers at the dōjō are Shidōshi Tuomas Kaski, Shidōshi Aapo Suhonen and Shidōshi Maija Kaski. Trainings are on Tuesdays at 17:15, and on Thursdays at 16:00. The first training (17.1.) will include a demonstration of the basic characteristics of the art. The course is free to university students and faculty members. For other students fee is 30 € and for employed people fee is 60€. * Extra training, make sure someone with a key to Unidojo is present. We train at UniDojo (Pohjoinen Hesperiankatu 23-25). We build a solid foundation for futher learning. We coach the new student in the basic principles of posture, movement, ukemi and acting as the uke and tori. We guide the students through the various aspects of the art, including unarmed techniques, weapon techniques, katas (training forms) and the schools. As the students gain experience, the basic techniques are applied in new ways and later the forms are examined through free application and adaptation. In our training, we constantly return to the basic forms and approach them from different perspectives. Our ultimate goal is, through our training, to become better in budo. You can start training whenever you like. We periodically organize demonstrations of the art, which are good opportunities to get acquainted with our training. New students that are university students or faculty members can train for free for the first two months. Students with different experience and skill levels usually train together and the difficulty is adjusted to suit the level of the students. No prior experience in the martial arts is required. The techniques and skills required to pass the first graduation are covered in approximately two months. We require that students be at least 15 years old. To start with, you can attend the training in gym attire such as sweat pants and a T-shirt. Later on, we recommend that students acquire a black training uniform (keikogi) and an appropriate belt (obi). New students can train for free for the first two months. After this, a membership fee is collected and a membership card is ordered from Japan. The membership fee is collected once per year and it allows the member to participate in all normal training sessions. There may be separate fees to take part in special seminars or other events. A separate fee is charged for graduations. Students or faculty members of Helsinki University are not required to pay the UniSport fee. Remember to use bank reference number. We accept Smartum vouchers as payment.